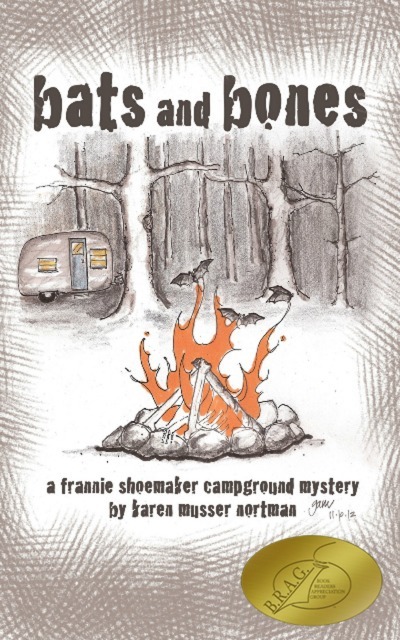 Karen Musser Nortman, a retired teacher and test specialist, is the author of the award-winning Frannie Shoemaker Campground Mysteries. 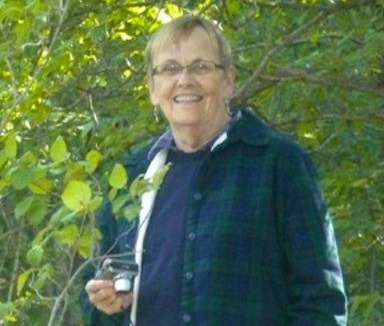 She and her husband Butch are enthusiastic RVers and frequently enjoy camping in the parks and campgrounds of the Midwest. The campground mysteries developed out of questions raised around the campfire by the peephole glimpses one gets into the lives of fellow campers. Where did those people disappear to for the last two days? What kinds of bones are in this fire pit? The first three books in the series are IndieBRAG Medallion honorees. "The Blue Coyote" and "Peete and Repeat" were both finalists In the Chanticleer CLUE awards contest. Her latest book, "The Time Travel Trailer," is a foray into science fiction involving a vintage travel trailer. Bats and Bones is a B.R.A.G Medallion Honoree. Frannie and Larry Shoemaker are retirees who enjoy weekend camping with their friends in state parks in this new cozy mystery series. They anticipate the usual hiking, campfires, good food, and interesting side trips among the bluffs of beautiful Bat Cave State Park for the long Fourth of July weekend—until a dead body turns up. Confined in the campground and surrounded by strangers, Frannie is drawn into the investigation. Frannie’s persistence and curiosity helps authorities sort through the possible suspects and motives, but almost ends her new sleuth career—and her life—for good. As a bonus, each chapter ends with a camping tip or recipe—some useful, some not so much. The Blue Coyote is an IndieBRAG Medallion honoree and a finalist in the 2013 CLUE Awards. Frannie and Larry Shoemaker love taking their grandchildren, Sabet and Joe, camping with them. But at Bluffs State Park, Frannie finds herself worrying more than usual about their safety, and when another young girl disappears from the campground in broad daylight, her fears increase. The fun of a bike ride, a flea market, marshmallow guns, and a storyteller are quickly overshadowed. Accusations against Larry and her add to the cloud over their heads. Frannie begins to puzzle out the mystery: Are the itinerant road workers as much of a threat as Frannie thinks? What about the lone woman camper who also disappears? Or is the girl's deadbeat dad behind it all? An IndieBRAG Medallion Honoree and a finalist in the 2013 CLUE Awards. A biking and camping trip to southeastern Minnesota turns into double trouble for Frannie Shoemaker and her friends as she deals with a canoeing mishap and a couple of bodies. Strange happenings in the campground, the nearby nature learning center, and an old power plant complicate the suspect pool and Frannie tries to stay out of it--really--but what can she do? After all, she is only curious, but sometimes it isn't just cats who have trouble with that! A trip down memory lane is fine if you don’t stumble on a body. Frannie Shoemaker and her friends camp at Old Dam Trail State Park near one of Donna Nowak’s childhood homes. They take in the county fair, reminisce at a Fifties-Sixties dance, and check out old hangouts. But the present intrudes when a body surfaces. Donna becomes the focus of the investigation and Frannie wonders if the police shouldn’t be looking closer at the victim’s many enemies. A traveling goddess worshipper, a mystery writer and the Sisters on the Fly add color to the campground.